Mr. P. has been a self-proclaimed vegetarian for a year and three months now (we thought it was a passing phase.) While I sometimes have to make an extra meal to accommodate him, we've decided to support him by eating vegetarian dinners at least three nights a week. 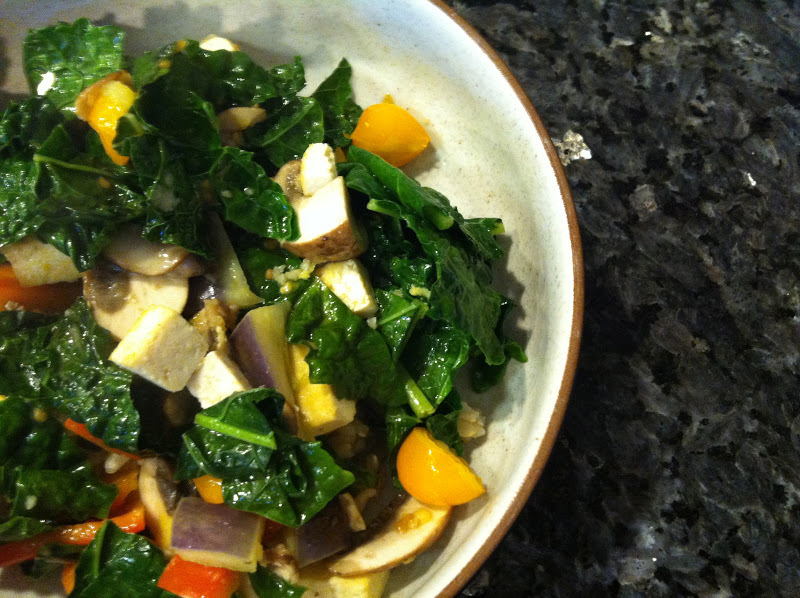 Here's an easy recipe for a vegetable and tofu stir fry - packed with protein and lots of fresh vegetables! 3. chop tofu into cubes and add to pan/ Let it cook on both sides for about two minutes over medium heat. 5. using a spatula or large spoon, keep turning veggies and tofu for about 5 minutes. 6. I like to shred my ginger over the stir fry at the last minute because I like the strong ginger taste. If you prefer, you can add the shredded ginger at the beginning when you add the garlic and scallions. 7. Top with some salt and pepper. 8. serve over brown rice with a little spritz of soy sauce.